For people of a certain age, or those whose kids have flown the coop, downsizing may seem a logical next step. However, there are lots of things to consider before making the big move. 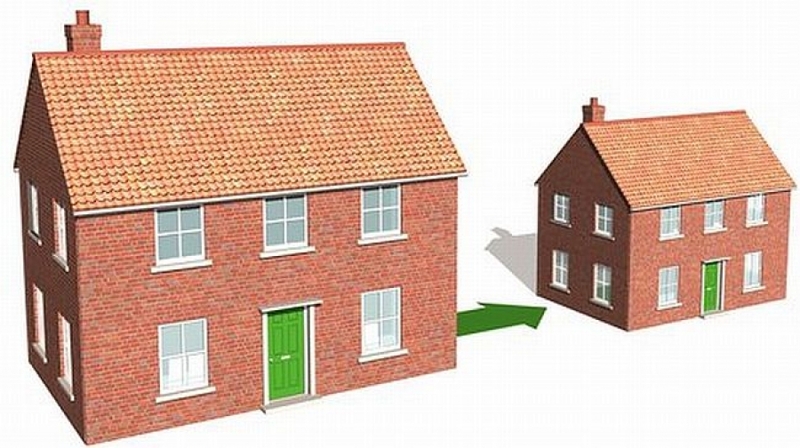 First, what does downsizing mean to you? It doesn’t always mean moving to a smaller home. “Downsizing takes on many looks and feels: some people living in large family homes still want a big home but with a more suitable floor plan,” says sales representative Debra Feldman of Forest Hill Signature Real Estate in Toronto. Downsizing from four bedrooms to three bedrooms (a master bedroom, an office and a guest room to be used for grandchildren sleepovers or a caregiver down the road) may be preferred. However, these buyers may still want the same amount of space for general entertaining, she says. Some people may want to move from the suburbs to the city to have easier walking access to the local coffee shop, yoga and culture, while others may prefer to downsize in the neighbourhood they are most familiar with, Feldman says. Feldman says downsizers should think about whether it’s necessary to have a dining room when there is a large eat-in kitchen. Would the dining room, which is often in a prime location in the home, be better converted to a room that will see more day-to-day use? Is the configuration of the home suitable for now and the future? Will long flights of stairs cause problems in the future? Is there a main-floor bathroom? Is there an elevator? Is there security if you plan to travel? Will that big lot be too much to maintain? How much will it cost to hire someone to do it for you? Jelinek says other common complaints include a lack of storage, and for those moving from a house to a condo, having to take elevators and park underground. “However, underground parking can be overlooked if the building has valet service,” he says. One way to deal with lack of storage is to make the most of every inch of space, whether in a smaller home or condo. Space should be functional for everyday living and entertaining. Storage space is always a challenge in condos, so finding creative ways to add more is invaluable, says designer Sabrina Bitton. One of her tricks is sure to be a hit with downsizers. Bitton says to build a bar-height island on wheels to fit over the existing, fixed island. That way it doesn’t take up additional floor space, but when entertaining, the top island can be wheeled out to provide separate dining space. Or it can be used as buffet space, a place to enjoy cocktails or additional work space. Downsizers who aren’t ready to give up their sit-down eating space find this a particularly welcome idea, she says. Feldman says she finds the location is often dictated by where adult children and grandchildren live. Possible future reliance on public transit is another consideration. Some people chose to cash out their large urban home and head to a small town. “This has appeal for some — less traffic, lower cost of living, easy access to nature and seasonal recreation, anticipating visits from friends and family where quality time can be enjoyed. Some also love the thought of making new friends and starting over, however for others this wouldn’t be comfortable,” Feldman says. Check the associated costs to ensure a smaller space will in fact be less expensive. Budget for the move and any work (renovations, cleaning, painting or other improvements) you want to make before you move in. Plan ahead and decide what you can/want to take with you. Give yourself plenty of time to pack. It’s never too early to start downsizing your possessions.